After over 11 hours of play, Terrence Mattison has outlasted a field of 450 to take down the $500 HPT Mini Series Main Event at The Meadows Casino outside of Pittsburgh. Mattison earns $42,821 for the win. Mattison came into the day 18th out of 43 players with 217,000 chips. By the end, he had collected all 9M chips in play. The unofficial final table of 10 players started around 3:30pm. It looked like the day could be over by late afternoon. Instead, we witnessed a marathon final table that lasted well over six hours. The final three players battled for nearly three hours before Bobby Noel went out in third place. Mattison and his final opponent, Ricky Ali, got the last of the chips into the middle on a 8dQhAd9h board with Ali's 8h5h trailing Mattison's Ah7h. The river 10s sealed the win for Mattison. According to our research, this is Mattison's first major tournament cash. He certainly made it one worth celebrating. 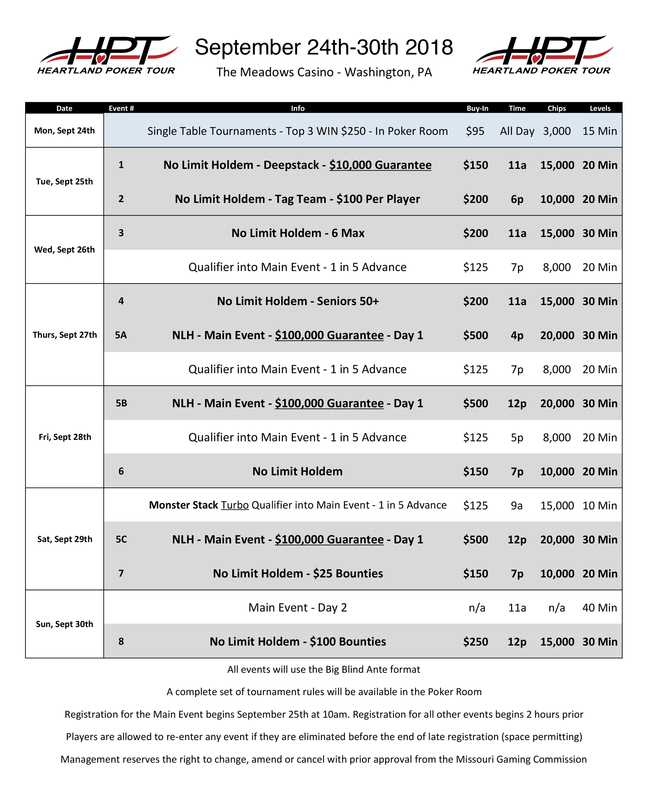 Next up for HPT is a Mini Series October 17-21 in Vicksburg, Mississippi. From there, the tour will head to Daytona Beach, Florida for a televised series at Daytona Beach Racing and Card Club. All of the details, including schedules and hotel offers, are available at HPTpoker.com. The Meadows Racetrack and Casino offers world class dining, events & entertainment just minutes away from Pittsburgh in Washington, PA. The beautiful property features a 350,000 square-foot casino, food court, premier steakhouse, simulcast viewing area, and a 24 lane state-of-the-art bowling center. The casino floor, one of the largest on the East Coast, features over 3,000 slot machines, 65 tables games, and a 14-table poker room that overlooks the 5/8 miles harness racing track. Visit The Meadows website for more information and join the fun today. Book a room at the nearby DoubleTree by Hilton for as low as $69/night. These exclusive rates are available September 22-30. Click HERE to make your reservation today. Or call 724-222-6200 and mention group code HPT.